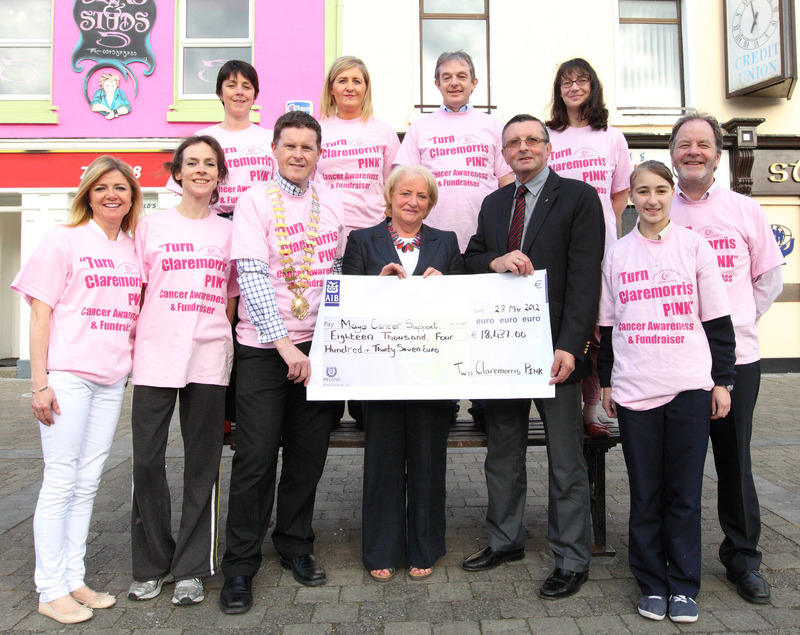 The committee of ‘Turn Claremorris PINK’ has formally handed over a cheque to Angela Kirrane for €18,437 which was the proceeds from the event held in April in aid of Mayo Cancer Support. The Turn Claremorris PINK day was a huge success and the committee would like to thank all who were involved in the day and to all who contributed to the fundraiser. Angela Kirrane of Mayo Cancer Support said they are delighted with the amount raised in Claremorris, all of which will be used in their Rock Road House facility in Castlebar to help suffers and families of cancer victims, and that it was a fantastic fundraising day to be involved in. Read the letter from Mayo Cancer Support. The town was a sea of pink with balloons, tee shirts and fancy dress. The ‘live’ music helped create a wonderful atmosphere and Mid West Radio greatly enhanced the whole event. Even the weather was in harmony. Angela expressed her sincere and heartfelt thanks to the Turn Claremorris PINK Committee for this enormous effort on their behalf. It was a day to remember and the goodness generated will continue to flow to the people in our county who need our support. A special Mass will be said on June 16th at 10am in St Colman’s Church Claremorris for all those who were remembered on the Tree of Remembrance that was in the Square on April 21st – the tree is now placed in Clare Lake. Claremorris is turning PINK again on April 21st for its annual fundraising day for Cancer. This year proceeds are being donated to Mayo Cancer Support who provides wonderful support to people going through cancer in their premises in Rock House in Castlebar. The day will be filled with fun and entertainment for all the family starting at 11am in the Square. Some of the events include a Children’s Treasure Hunt, Beavers Bouncy Castles, and local sports clubs organising events throughout the day. Mid West Radio will broadcast live from town in the morning. Later in the afternoon an Interactive Styling Class and Fashion parade will take place in the very stylish surroundings of Maxwell’s. Ten beautiful ladies who have all being through Cancer will show off clothes from Claremorris Boutiques, they will also be made up by the local Hair Salons and Beauticians. Rita Mellet of RMI Branding will show you The Top Ten steps to the perfect wardrobe and what types of clothes suit body shapes. A Tree of Remembrance where people can place a ribbon in memory of those who they have lost through Cancer will be at the Square on the day. A special Mass will be commemorated for all the people later in the year. 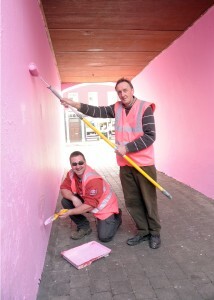 The wall is so bright I've got to wear shades: X (with the brush and the shades) and Y (with the roller) paint the Arch in Claremorris ahead of the annual Turn Claremorris Pink event, in aid of Mayo Cancer Support. Photo: Karl Keaney.